We often hear about Centers of Excellence but what does this mean? I think it should be fairly obvious but apparently it’s not. For parents, family members, people with intellectual/developmental disabilities (IDD), advocates, community members, healthcare providers, vocational and recreational support people, it generally means a community which interacts and supports those with IDD in all aspects of their life in a manner which provides the best quality of life for that person. It is a collaborative effort from all angles. This can be done but for some reason, even though we hear about needing centers of excellence, they are being broken down rather than built up by the very agencies which should be supporting them. Here in Washington State the Developmental Disabilities Administration recently proposed a “feasibility study” at the cost of $601,000 to actually dismantle much needed Nursing Facility for those with IDD which also provides respite for many across the state, evicting the current residents from their home to create a “Center of Excellence” which has a totally different definition than one would expect. There are so many things wrong with this proposal which was most likely generated by a recent court decisions regarding people with mental health issues and the fact that federal reimbursement for care is better in the Developmental Disabilities Arena than in the Mental Health Arena. This proposal needs to be stopped before it goes any further, wasting our valuable funds on things when those critical funds could be used for so much better, actually providing services and supports utilizing existing resources and building up what we have rather than tearing down, dismantling and rebuilding programs which would actually provide less than what we currently have. This makes no sense. Our state has a history of doing just that. In 2012 Frances Haddon Morgan Center was closed, a Residential Habilitation Center (RHC)which was home to over 50 residents and provided much needed respite care. FHMC was also situated on the western side of the state providing an alternative which was closer to many people’s homes of origin. This was a huge political mess with much misinformation provided and believed by those who made the decision but the decision was made which The Arc, the Developmental Disabilities Council and others celebrated as a victory. At least one young man’s life was lost as a direct result of this closure and many others were displaced more than once from one home to another. This alone is inexcusable. The other issue is the misinformation regarding “cost savings” and the fact that many now are being denied services which could have been provided if FHMC was still operational. FHMC is currently just a building, empty, sitting unused for many reason – it is a shame to walk through the campus and know what good use it could if only it would be allowed to be utilized. Families and communities are hurting due to this decision. What did happen was that there was no cost savings at all – in fact, just the opposite. Rather than building several crisis care centers located strategically around the state, there has been one center for youth which has can serve up to 3 youth at a time. The program which was built to “replace” FHMC has been open since December 2012. To date they have served 12 children, only one of whom returned to their family home (which was one goal of this program). The current cost of this program is $1,165 per day. This is the program for which FHMC was shut down for – how many people are now going without help, are suffering in crisis due to this huge error on the part of some so-called advocates? We can’t let history repeat itself yet that is exactly what this “feasibility study” is doing. It must be stopped before it goes any further. Let’s look at what a “Center of Excellence” really is and build these up with the resources and available space we have – it’s all there already – it just needs to be utilized appropriately. Our state (Washington) is really doing a horrible job of taking care or our most needy citizens. Even though it is written in our constitution to foster and support care, the care has been denied through legislation. I wonder if our legislators and so-called advocates have read the Washington State Constitution, specifically Article XIII. If not, now may bee a good time to read and understand. With the recent unanimous Washington Supreme Court ruling regarding “boarding” of mental health patients in hospital emergency room as unlawful I hope that the lack of care for our citizens with intellectual disabilities will also be scrutinized by our courts. The legislature has continued to reduce care and supports for the people who are most in need. We have heard that closing and down-sizing facilities which specialize in caring for people with high support needs will save our state money – but does it? Even it it did save money, which is highly doubtful when looking at the budget as a whole, was it the ethical and moral decision to make? Was it ethical and moral to deny people safe and skilled care they need to survive? We are currently in a horrible crisis – not necessarily due to lack of space but due to lack of support by our legislature. These services are controlled by our legislature and because of bad and poorly thought out decisions, critical services have closed and there has been no replacement or alternative. People and families are being destroyed due to these decisions while residential buildings sit empty because they are not funded to provide caregivers for people in crisis. For instance, we had one Intermediate Care Facility for people with Intellectual Disabilities which served over 60 people and also managed to provide crisis respite for children and adults. Frances Haddon Morgan Center closed with promises of more community options. Where are these options? They have not materialized at all. Was this a wise decision? Not in my opinion and in the opinion of many others. Currently we have many people in crisis asking for residential care and again, even though they see beautiful, remodeled homes on campus settings with trained, stable staff and supports, they are forbidden to access this care. I would like to see every legislator take a tour of Fircrest Residential Habilitation Center in Shoreline, take a look at the empty duplex on this beautiful campus then listen to the stories of people in our community in crisis who have requested respite and admission and have been told “no – we have no space.” After this experience, I would then like to hear your recommendation to the other legislators on what we should do to minimize the crisis to our families and support our communities. It’s not secret, our state has made a huge mistake. We have legislated a huge gap in care for our families experiencing life with intellectual disabilities, particularly if the person is 21 or under. In 2011 our state passed SSB 5459. This bill had several critical errors – some based on faulty cost reports and projections and some based on poor judgement and understanding. Crisis care, respite and intense out-of-home placements were eliminated for those 21 and under. The thought was that “children need to be at home with their families.” Yes, that is true but as one of the directors of the newly forming Crisis Stabilization Unit testified, “some families do not want their kids back home.” That statement made me physically ill because it stigmatized families who are not able to safely care for their children, no matter how much they WANT them at home, it is impossible. To say these families “do not want their kids” home shows such disregard and misunderstanding for the stress these families live with. Five years ago I never, ever would have imagined that I would not be able to care for my son. On the eve of my 55th birthday, as I look back over the past 5 years, our family went from one of unity and cohesiveness to obliteration. The only reason that we are here to tell the tale is due to out-of-home placement at the intermediate care facility when my son was 15 years old. The heartache I felt making this decision was unbearable and still, today, it greatly saddens me that I cannot care for my son – no matter how much I would love to, I can’t. In the past 5 years not only did my son’s dementia worsen which led to prolonged mania and psychosis – on top of his already profound developmental disability, but in my attempts to care for him, my health plummeted. I have had 27 hospitalizations and/or surgeries in the past 5 years with many complications. Injuries incurred from caring for my son began to build up over time and I felt like I basically imploded. The development of a chronic lung disease (autoimmune) and the related symptoms make it impossible for me to care for my son – yet people don’t see this part of the family’s lives. Rather than understand, people judge – as the director did of the families who could not have their child return home. Frances Haddon Morgan Center (FHMC) was closed. FHMC could care for 60 individuals with full, comprehensive, intense crisis care, provide much needed respite, and provided much of the care for our youth and for those with autism. There were some extremely costly errors which led to “savings” projections which were actually Costs. This never should have happened, but it did. I can’t even begin to write about the stupidity of the decisions so am just providing this photo. I think it will give an idea of what happened – how much more money was spent to serve about 1/10 the people – certainly not a cost-effective or sustainable decision – serving much fewer people for over twice as much! According to Informing Families Building Trust (Developmental Disabilities Council) the passage of SSB 54559 in 2011 created a huge gap in services. Not only did this bill close Frances Haddon Morgan Center but also prohibited those under 21 from being admitted to an RHC. Many of those in this age group would have gone to Frances Haddon Morgan Center for crisis care and respite. To bridge that gap, DDA opened a house in November 2012 which could house 3 youth ages 8-21. The services are very similar to what was provided at Frances Haddon Morgan Center. The goal was to take these children as they are in the community, stabilize them as much as possible and slowly integrate them back into the community. There have been 7 children able to utilize these services, 2 are currently residing there, of the 5 who have left, only 1 was able to return home with supports. The other 4 were placed in voluntary placement services – an intensive out of home placement for those under 21. Please review the “savings” from closing Frances Haddon Morgan Center. According to the reports we would have had a large savings to not only open two crisis stabilization centers but provide more community care. Unfortunately, the projections were so wrong that we have now created more of a crisis. Please do not let this happen again – It is critical to review the DD Audit and understand the information provided in that report is as skewed or more than the data provided in 2011 for the disasters that SSB 5459 produced. Many of our supportive communities are being destroyed. People are being evicted from their homes and dispersed to isolated housing in the name of “inclusion.” The reason this is happening is because people and agencies are being misguided with inaccurate information, both with regards to costs and with respect to the 1999 US Supreme Court Decision Olmstead. It is for this reason that I am providing this information in my attempts to clarify what the costs are and what choice means to those of us who care for our loved ones who have limited abilities to make their own safe choices. When looking at costs, direct care costs are the most logical cost to compare since this is a cost that is needed in all types of supportive residential settings. This is the basic cost and the one that is most often reported for the cost of care in community residential settings. The costs reported for supportive communities (Intermediate Care Facilitates/Intellectual Disabilities (ICF/ID), Nursing Facility/Intellectual Disability (NF/ID) and Residential Habilitation Centers (RHC) ) are generally very comprehensive costs and by the very definition will be more expensive than the direct care costs reported for community settings. Below are the lists of services that are included in the comprehensive costs for the supportive communities. 1. The cost of care increases as the support needs for the person increases – those needing more support have a higher cost for direct care. 2. The Economies of Scale come into play – in supportive communities, even when the support needs are high, the cost of direct care is lower per person, on average, than in isolated homes. In Washington State, this became especially evident with the closing of Frances Haddon Morgan Center, one of our state’s RHCs. In addition to looking at the Economies of Scale in action with the downsizing and closure of one of our RHCS, we were also able to obtain the average daily cost of care for community residents with the highest support needs. 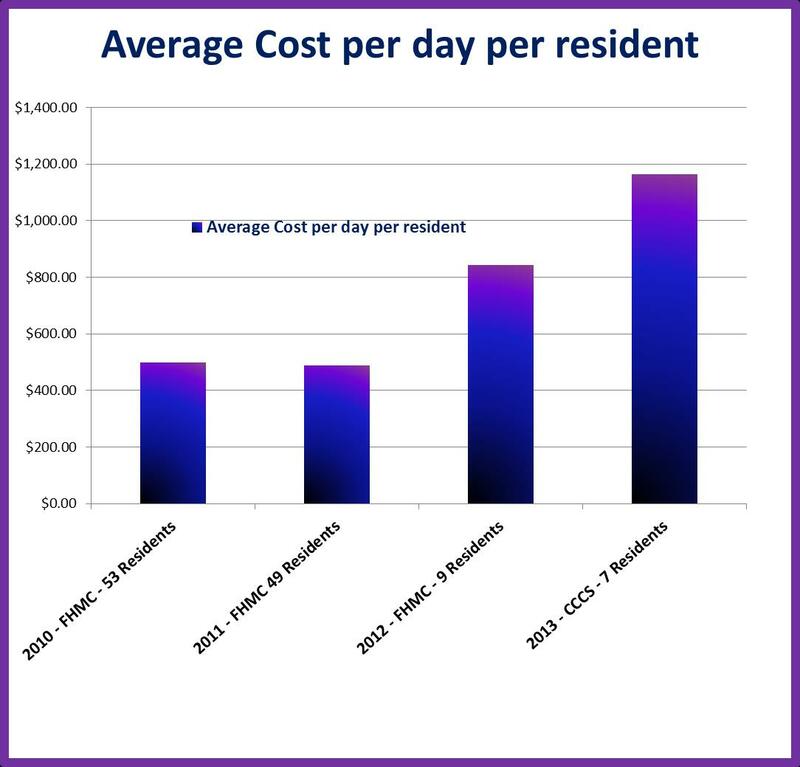 The chart below illustrates that as the size of community decreases, the average cost per resident for care increases. The cost difference between 49 residents and 9 residents for Frances Haddon Morgan Center is astounding. Moving these residents from their homes proved disastrous for several of these residents, death to one, hospitalizations and crisis to others – all for what was assumed to be a cost saving measure. This experiment failed on many levels. It’s time to actually look at the real data, understand what the data represents and move forward. One man died from negligence – there was laundry detergent stored in a milk carton, left on the counter and this man, who had been moved out of his home at Frances Haddon Morgan Center to a “community” home drank it and consequently died. This man had a known disability of PICA (eating non-food items) but regardless of that, the fact that a non-food item had been stored in a food container is negligence – not accident. I can only imagine the pain and suffering this man experienced in the few weeks between the time he drank this and when he eventually died. He suffered immensely. Yet does anyone care? There were no charges filed. If this had occurred in a day care center I can assure you there would have been charges filed but because this man had a developmental disability and the state was his guardian, there is no one person to watch out for him and advocate on his behalf. Our state has passed a law which discriminates against our youth with developmental disabilities. Youth with high support needs who could be cared for safely and appropriately in one of our remaining residential habailitation centers are no longer able to access those services. The only option left is crisis hospitalization or jail. Is this progress? What is also very disturbing is that this legislation was passed based on false information which was stated as “facts”. These “facts” are not supported by the data from which they were drawn but the legislator who sponsored this bill chose to ignore any information that he found “uncomfortable”. Others, when questioned about the supposed facts told me that they say no benefit in reviewing the questions I raised because the state did the research and wondered why I would even question what the state provided. This is they type of “leadership” we have. This is frightening. It’s time to pull their heads out of the sand, face the uncomfortable issues and address the questions. Until this happens and there is a real dialogue, there will not be progress. I have written to the Research and Data Analysis Division of the Department of Social and Health Services asking them to review the “research” report which was used extensively in this damaging legislation. I have written to the Developmental Disabilities Service Task Force raising critical questions that need to be addressed. I am hoping to engage in some real discussions which will tackle real issues and facts. We are uniting and you will hear more of our stories of survival. The Division of Developmental Disabilities (DDD) does not want our families to meet and build a community or allow our vulnerable children to live in safe, stable and sustainable community. Sounds strange saying that about a department which claims to value community and families and strives to keep citizens in their communities, doesn’t it? It’s unfortunate but true that DDD, the agency which we need to work with to get services for our vulnerable family members with intellectual disabilities seems to do all it can to create crisis and chaos. We are not survivors because of the help and assistance which DDD provided but because we fought unbearable struggles for our children and family members. We fought DDD so that our family members could receive the “allowable” services on the Home and Community Based Waivers they were on. We fought against DDD telling us to call the police for crisis care. We fought against DDD telling us to restrict fluids so that our kids would not need extra absorbent diapers (for a neurological problem) . We fought against CPS reports about the methods that we, as families, needed to do in order to keep our children safe from harm (putting special locks on doors for instance) . We fought for allowable “home modifications” so our families could be safe. You do not hear from those who are still struggling and in crisis. I believe DDD wants to keep it that way. Those families probably can only muster enough strength to barely make it through the day and survive – they have no energy or time left over to make their stories heard. They barely manage (if you can even call it that) in isolation. That’s the way DDD wants to keep it. I know, I was there. This is why we, as survivors, must tell the story for them in hopes that they, too, may become survivors, succeeding at stable, sustainable care for their loved ones. #1 – teen grew up in Seattle. Family and healthcare team requested out of home placement at Fircrest Residential Habilitation Center (6 miles from the family home). DDD DENIED. After continued crisis and multiple hospitalizations and total family breakdown with the child at age 15 in his own crisis, DDD did say that child could possibly be admitted to Yakima Valley School ( YVS) (144 miles away from the family home) or Frances Haddon Morgan Center (FHMC) (24 miles from home via hour long expensive ferry ride or 70 miles via highway). DDD continued to deny admission to Fircrest (even short term or respite) to Fircrest which was in this child’s home community. Family chose to admit son to FHMC (2009) then petitioned the Division to move him to Fircrest due to continued health problems of parents and siblings which made it extremely difficult to visit son at FHMC. Request to move this child back home to the community in which he grew up was granted after one year. He currently lives at Fircrest, is stable, healthy and active in his home community. #2 Family lives in Bremerton ( a mile or two from FHMC) yet DDD placed this teen at Fircrest (2008) prior to the closing of FHMC and they were still admitting teens here (see #1 who was admitted in 2009). Family had been denied placement and was told the child would have to go to YVS (194 miles from family home.) Child was able to be admitted to Fircrest (40 miles from family home where he currently lives in his community at Fircrest). #3 DDD palce child at FHMC (90 miles from home) when Fircrest is 18 miles from the family home. Child now lives at Fircrest due to FHMC closure. #4 DDD place child at FHMC (again 90 miles from home) when Fircrest is 18 miles from the family home. Child now lives at Fircrest due to FHMC closure. Again, these are just 4 examples yet do they exemplify DDD attempting to keep our youth in their home communities? This is not due to not having available resources and services in the home community. As you can see, there were alternatives for each of these families which would have allowed their child to remain much closer to home than the placement that DDD finally agreed to. We are gathering more so that people can hear the true stories of these families in crisis. Currently, we are facing an issue with an 18 year old who is at Fircrest on a short term stay. There are no safe alternatives in the community yet DDD is denying the requested admission to Fircrest. In just the short time that this boy has been at Fircrest he has stabilized and has started to sleep through the night. He is feeling safe and at home due to the support needs that he requires being available. The family has requested that he be admitted. This boy has been on the CIIBS Waiver, a federal HCBS waiver which states the family has the choice of in=home or institutional care. The family has chosen institutional care after in=home care failed miserably and put this boy and his family at great risk of injury. DDD is denying admission – based on age. This is discrimination. There are no other safe alternatives for this boy yet DDD is planning a discharge. To where? We will find out what their plan is this week.